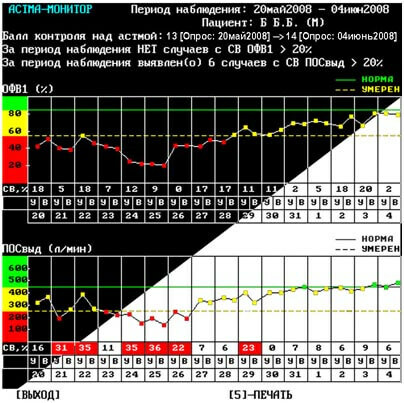 Program “Asthma- monitor” was for the first time represented on May 27, 2008 at the provincial pulmonary conference in city Grodno (“Grodnensk provincial clinical hospital”). Program “Asthma- monitor” is installed in any MAS-1 spirometer with the color picture screen and is intended for the daily monitoring of PEF and FEV1 of patients under the conditions of hospital (pulmonary, allergological departments). The graph of monitoring is accessible both on the screen of instrument and in the printed protocol of the A4 size. It communicates automatically about the diagnostically significant cases with the daily variability of PEF, FEV1 exceeding standard. On the basis of conventional children's and adult test- questionnaires on the control over asthma (Asthma Control TestTM) into the printed protocol is derived also mark on the control over asthma with the interpretation. Data of monitoring are stored in the energy-independent memory of instrument and can be used as needed, for example, for the repeated hospitalization for the purpose of the selection of pharmacotherapy.